Handwashing is like a "do-it-yourself" vaccine— it involves five simple and effective steps (Wet, Lather, Scrub, Rinse, Dry) you can take to reduce the spread of diarrheal and respiratory illness so you can stay healthy. Regular hand washing, particularly before and after certain activities, is one of the best ways to remove germs, avoid getting sick, and prevent the spread of germs to others. It's quick, it's simple, and it can keep us all from getting sick. Handwashing is a win for everyone, except the germs. Keeping hands clean is one of the most important steps we can take to avoid getting sick and spreading germs to others. Many diseases and conditions are spread by not washing hands with Handwash and clean, running water. •	Elegance in quality with excellent ponds fragrance. •	Effectively maintain the skins naturally. •	Keep your hands soft and supple. 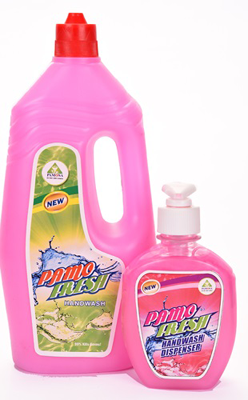 •	PAMOFRESH hand wash cleans your hands and maintains good skin as well. This contains a blend of natural ingredients like sandal and extra moisturizers for hydrated and soft hands. It also gives a positive effect on dull and damaged skin. •	It maintains clear skin as well as suppleness and elasticity of the skin. It gives protection to fight germs and maintains pH balance. This also has a very pleasant smell. Press nozzle gently to get PAMOFRESH Liquid Hand Wash on the wet hands. Rinse. Dry off. Using it everyday protects hands from germs and helps keep them hygienically clean and refreshed. •	People frequently touch their eyes, nose, and mouth without even realizing it. Germs can get into the body through the eyes, nose and mouth and make us sick. •	Germs from unwashed hands can get into foods and drinks while people prepare or consume them. Germs can multiply in some types of foods or drinks, under certain conditions, and make people sick. •	Germs from unwashed hands can be transferred to other objects, like handrails, table tops, or toys, and then transferred to another person’s hands. •	Removing germs through handwashing therefore helps prevent diarrhea and respiratory infections and may even help prevent skin and eye infections. Teaching people about handwashing helps them and their communities stay healthy. About 1.8 million children under the age of 5 die each year from diarrheal diseases and pneumonia, the top two killers of young children around the world. •	Handwashing with Handwash could protect about 1 out of every 3 young children who get sick with diarrhea and almost 1 out of 5 young children with respiratory infections like pneumonia. •	Although people around the world clean their hands with water, very few use Handwash to wash their hands. Washing hands with Handwash removes germs much more effectively. •	Handwashing education and access to Handwash in schools can help improve attendance. •	Good handwashing early in life may help improve child development in some settings. Preventing sickness reduces the amount of antibiotics people use and the likelihood that antibiotic resistance will develop. Handwashing can prevent about 30% of diarrhea-related sicknesses and about 20% of respiratory infections (e.g., colds). Antibiotics often are prescribed unnecessarily for these health issues. Reducing the number of these infections by washing hands frequently helps prevent the overuse of antibiotics—the single most important factor leading to antibiotic resistance around the world. Handwashing can also prevent people from getting sick with germs that are already resistant to antibiotics and that can be difficult to treat. Kids don't always listen when parents tell them to wash their hands before eating, after using the bathroom, or when they come inside from playing. But it's a message worth repeating — hand washing is by far the best way to prevent germs from spreading and to keep kids from getting sick. Germs are everywhere and your hands may carry them and cause infection to yourself and your loved ones. Children are most vulnerable to get infections, hence instilling good personal hygiene in children such as inculcating hand washing habits is vital for their health and well-being. Children are active by nature, as such their hands tend to pick up germs while they are moving around and touching various surfaces. When they use the same dirty hands to touch their face, rub their eyes or place the fingers in their mouth, there is a risk of germs entering the body, which can lead to infections such as diarrhoea, acute respiratory diseases and hand, foot and mouth disease (HFMD). Each year in developing countries, about 1.5 million children die from diarrhoeal diseases due to poor hygiene and lack of access to proper sanitation. These diseases can be prevented. Hand washing is one simple solution that children can learn to protect themselves against infectious diseases. According to the World Health Organization (WHO), hygiene interventions including hygiene education and promotion of hand washing can lead to a reduction of diarrhoeal cases by up to 45%. By getting children to wash their hands, which is usually the first line of defence against the spread of many diseases, the rate of infection is reduced significantly. Getting children to wash their hands thoroughly may not be easy at first, but once they learn the proper hand washing techniques and understand the reason behind it, they will pick up this habit in no time. It is important to instill a sense of fun when teaching children how to keep their hands clean. For instance, parents and caregivers can add in a hand washing quiz or game that kids can participate actively and perhaps be rewarded at the end for their efforts. This helps them to remember the various steps in hand washing. Cultivating the good habit of hand washing is not only limited to children, parents and caregivers should also wash their hands as they can pass the germs to their children. The 2005 World Health Report mentions that households can prevent illness by washing hands after defecation, before preparing meals and before feeding children . Keeping hands clean is a form of social responsibility that helps in reducing the risk of infections. The simple act of washing hands with Handwash and water can save many lives. Children tend to look up to parents and caregivers as their role models and follow by example. So parents and caregivers should set a good example by demonstrating good personal hygiene habits. Washing hands properly and thoroughly is one of them. Apart from hand washing, leading a healthy lifestyle is equally important. •	If you use a bottle make sure it is small. This is particularly important if children will be using your hand washing utensils as little hands may not be able to grasp and maneuver a large bottle. •	Choose one which doesn’t irritate their skin and keep them soft & smooth.